All businesses in Cobham were invited by The Cobham Chamber of Commerce to enter a competition for the Best Dressed Christmas Window Display. In this our first year in Cobham, Lodge Brothers were awarded Joint 2nd Place for our Christmas Tree display. 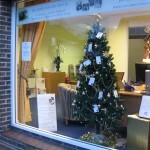 Claire Nightingale, Funeral Arranger at Lodge Brothers Cobham placed a notice in the branch window inviting people to come in and write a message to a lost loved one on a card and to place it onto our Tree of Remembrance, where it will remain until Twelfth Night.